In 2015-2016, the Junior League of Jacksonville delivered BOLD programs and wonderful member experiences. The Fresh Minds Program was established to focus the Junior League of Jacksonville’s community efforts on improving the availability of healthy food, providing nutrition education, and promoting health and wellness to local low-income schools and communities. Members volunteered with the Clara White Mission’s White Harvest Farms to bring nutrition education and fresh produce to the community – even alongside Mayor of the City of Jacksonville. The public affairs committee convened a community partnering meeting to discuss food access and healthy eating with Junior League of Jacksonville members and representatives from Feeding Northeast Florida, Edible Northeast Florida Magazine, Florida Organic Growers, Sanctuary on 8th Street, First Coast YMCA, LSF Health Systems, Florida Department of Health, UF IFAS, and the Clinton Foundation. We hosted the first ever Unique Boutique, a shop-for-a-cause event at the Riverside House. Members enjoyed shopping and “Ladies, Legacy, and Lunch” speakers, Councilwoman Lori Boyer; Community Advocate, Pam Paul; and Ju’Coby Pittman, Executive Director of the Clara White Mission. The 25th Anniversary Whale of a Sale, Preview Party Event was both beautiful and fun. The party celebrated past event chairs and our work in the community. The sale was a tremendous success, providing thousands of items at a low cost to the community. The Junior League of Jacksonville’s Little Black Dress Initiative was initiated. Members shared information about the BOLD Junior League of Jacksonville legacy and our work with the Fresh Minds program through Kids in the Kitchen, DIAD, and CARES, to thousands through social media. 47 members participated in a five-day social media campaign. Each wearing a little black dress each day to bring attention to the cause. Junior League of Jacksonville members grew in leadership and developed a strong path for the future. A strategic plan for 2016-2019 was developed and approved for use. A design for the Riverside House is under development involving the accessibility, functionality, and beautification of the headquarters site for years to come. 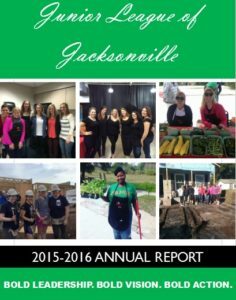 View the Junior League of Jacksonville’s 2015-2016 Annual Report.